August has been vanquished, mercifully. I could feel it yesterday as though just getting rid of that word August from the dateline lifted a huge weight off my shoulders. The same concerns are there and little has changed but there was just a subtle and perceptible psychic shift. Maybe the cooler temperatures and the slight breeze that hung around for much of the day added to the perception as well. Whatever the case, it was good to see August depart and September enter the picture. The days and months ahead always seem to better fit my natural mood and demeanor. I like to start the month by playing some version of the great old classic September Song, long one of my favorites. Written by Kurt Weill with lyrics by Maxwell Anderson, it was first sung, surprisingly, by Walter Huston in the stage production of Knickerbocker Holiday back in 1938. Since then it has been covered by literally many hundreds of musicians and singers throughout the world and most of them are pretty damn good versions. It’s just that good a song. It’s a bittersweet and slightly melancholy reflection on the passing of time, that inevitable march to old age symbolized in the turning of leaves and the shortening of the days. These precious days, as the song says. It’s a great pleasure going through the many versions online but I thought I’d share the Bryan Ferry version this year. I was never a huge Bryan Ferry fan but I did like some his work with Roxy Music as well as some of his solo work. His voice works well in this delicately sung version. Enjoy and remember to take some pleasure in these precious days. August has finally and thankfully passed. You would think as one gets older you would want to hold on to every moment–every day, week and month– but August never passes quickly enough for me. This distaste for August has given September an almost magical appeal. The very sound of the word feels cool and easy in my mind. Relieved from the hard edges and sharpness of August, September brings cooler air and falling leaves. Time passes just as quickly but there is a calmness which allows for reflection. In September, I often find myself stopping and just standing, looking into the sky and absorbing the moment, glad to just be where I am. Maybe that’s why I love the old song September Song. It’s a wistful reflection on the passing of time and aging. Composed by Kurt Weill, it was written for and first recorded by Walter Huston for the Broadway play Knickerbocker Holiday in which he plays Peter Stuyvesant, the governor of New Amsterdam (present day New York) in the 1600’s. 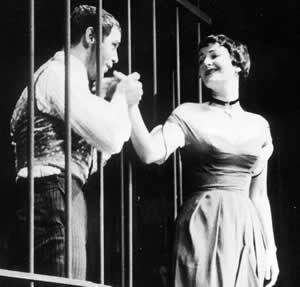 The play didn’t have much success but the song, written for Huston’s limited vocal range and rough voice, has lived on as one of the great standards of modern music, recorded by scores of artists over the years. Today I thought I would play a beautiful version from the one and only Ella Fitzgerald. As I look out of my studio window, it is cool and foggy and the words and sound of this song just feel so right for the first day of September. It’s hard to believe that September is upon us already. September always has a contemplative feel, a pause after the hustle and bustle of the summer months before making the transformation into the cooler, grayer months. The leaves begin to turn. The days get shorter. The air takes on a cool hardness that is a keen reminder of the coming coldness of the winter. One of my favorite songs is the classic tune from Kurt Weill, September Song. It’s been recorded by literally hundreds of artists through the years from many genres, from Jimmy Durante to James Brown to Lou Reed. Willie Nelson does a rendition that is very delicate, maintaining the tenuous nature of the tune. Just a lovely version. I’ve included it at the bottom. 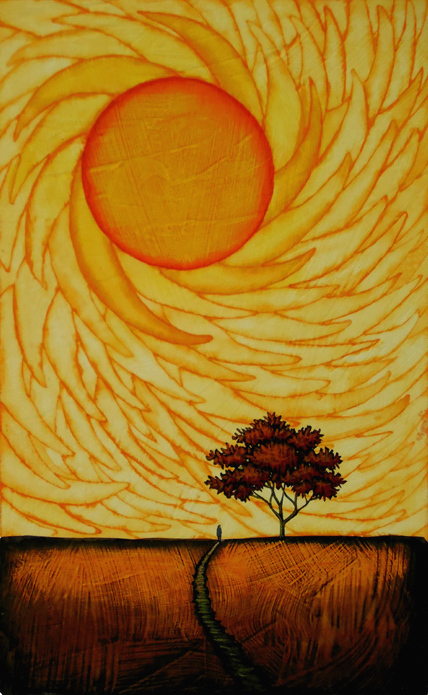 The image here is a new piece, a 6″ by 10″ painting on paper that I am calling September Song. It is part of a group that will be accompanying me for the trip to the Principle Gallery on September 13th, when I will be giving a gallery talk there. More info on that later. This painting has a wistful feel, as though the tiny figure is pausing on the path to reflect on where he has been, what he has seen and done. 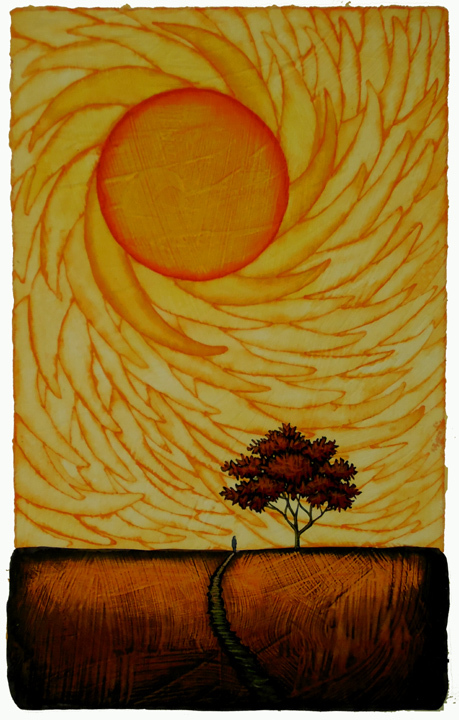 The sun above and the churning rays of light emanating from it represent the inevitability of time, of change. I wasn’t sure what to title this painting but when I realized that we were into September, the tune immediately came to mind and the narrative of the scene filled out for me. It’s that time of the year. Cooler. Darker at the edges with leaves coming down. A feeling of reflection comes with this turn from summer to autumn and it inevitably brings to my mind September Song, the old Kurt Weill standard. It is high on my list of favorite songs and at this time of the year I tend to seek out versions of it that I haven’t yet heard. There are so many to find by such a wide array of artists, from Sinatra to Lou Reed. I came across the version below from a guitarist I bet most of us have never heard before, Lenny Breau. I know that I didn’t know his name or work, which is a shame given the scope of his talent. He was a great jazz guitarist who died in 1984 at the age of 43 , the result of a murder which remains unsolved to this day. Another shame. But he left behind a body of work that is wonderful and his playing is well known in some circles. 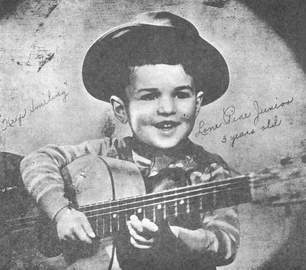 His version of September Song comes from a CD, Boy Wonder, that was released after his death. It contains a group of work that he recorded as a 15 year-old when he was a studio musician in his native Maine. Beautiful work for such a young player which does this always lovely song great justice. It’s one of those cases of one thing reminding you of something else. I heard Bobby Darin’s swinging version of Mack the Knife yesterday and there’s a line that ends with and Lucy Brown. One of those parts of a song that your mind is somehow attuned to and always hears whenever the song is played. Anyway, it immediately reminded me of seeing Bea Arthur, of Maude and Golden Girls fame, a number of years back in a one-woman show on Broadway of personal stories and song. Going in, I knew only a little of her career outside the TV roles so I didn’t have high expectations. I was pleasantly surprised by a great show. I didn’t know much of her Broadway career and didn’t know she originated the role of Lucy Brown in the original Broadway version of The Threepenny Opera back in the ’50’s. She told several great tales about the show and then did a stirring version of the The Pirate Jenny. 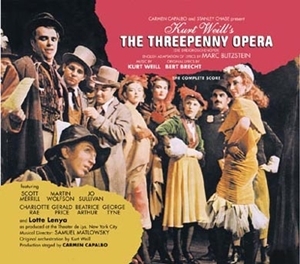 I’m embarassed to say that I didn’t know much about The Threepenny Opera or Brecht or Kurt Weill. Had never heard the The Pirate Jenny and it’s story of a cleaning woman who daydreams of rising from her life of powerless drudgery to become a powerful and cruel pirate. Great song with great imagery and Bea Arthur’s version was wonderful. Angry. You could feel her desire for retribution for every time she was wronged by those who simply overlooked her and took her for granted. It was a very powerful song and one that became and remains a personal favorite. 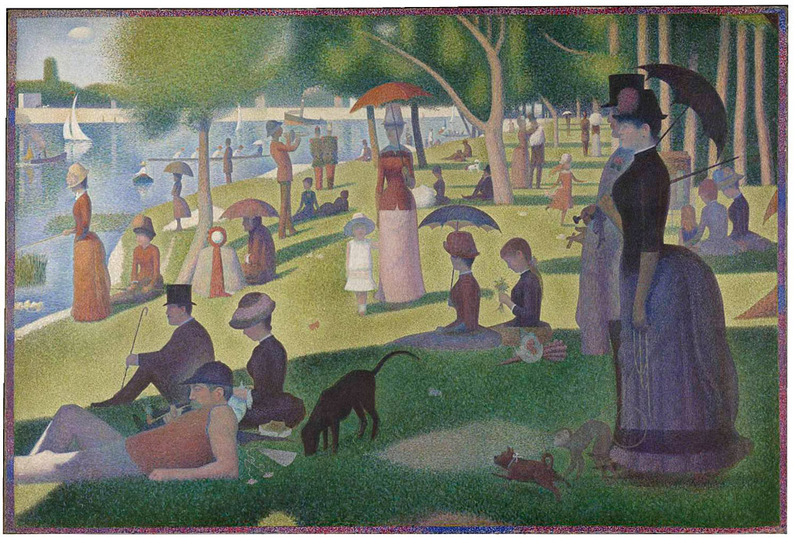 When most people think of paintings by Georges Seurat, the French pointillist painter, they probably think first of his famous painting, Sunday Afternoon on the Island of La Grande Jatte which is probably remembered by many as Sunday In the Park With George , from the Stephen Sondheim play which revolves around the Seurat painting. 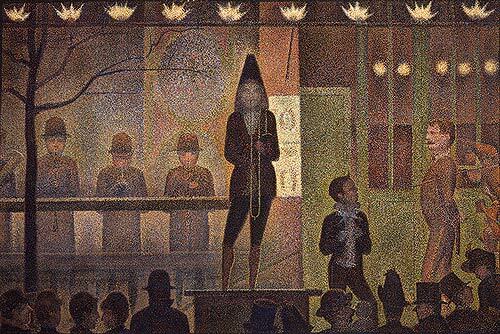 For me, the Seurat paintings that spring to mind are a couple of his pieces that revolve around the circus, such as the one at the top of this post, Circus Sideshow. For me, this painting just has magical, mysterious feel. I can imagine the tinny sound of the musicians, a kind Kurt Weill/Threepenny Opera quiet cacophony. The composition of this piece also reads very easily into my brain and I find myself excited by it to the point of envisioning work of my own that will borrow from the light and dark blocking of the piece, the way the figures are between dark borders formed by the patterned edge at the top and the shadowy people at the bottom. While I can appreciate many paintings just for what they are and their own sheer beauty, it’s the paintings that spark something in myself, that inspire something in my own work from some connection in that painting that jumps out at me, that are usually my favorites. 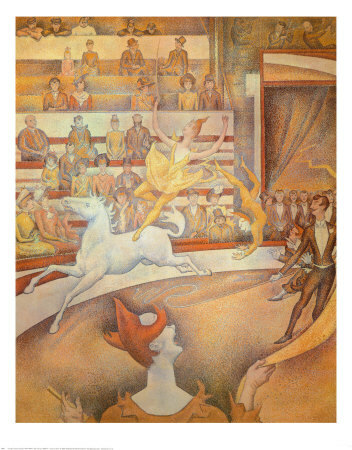 These Seurat circus paintings do that for me. While I find many of Seurat’s other paintings pleasant enough and lovely to see, they don’t fire my imagination in the same way. Maybe it’s the subject matter. Maybe it’s the angular edges in these compositions compared to the softer , rounder edges of the Park painting, for instance. Maybe it something as simple of the colors of these pieces. I don’t know. I just know they make me want to get something down on paper or canvas quick before the inspiration fades. Walking down to grab the paper this morning and everything was shrouded in fog. It was very early, before 6, and the morning light was still trying to gather, giving the scene a haunting, ghostly appearance. Chill in the air. It really made me think of one of my favorite songs, September Song, the beautiful old Kurt Weill song that has been performed by hundreds of artists over the last seventy years, from Sinatra to Willie Nelson, who does a lovely, delicate version. 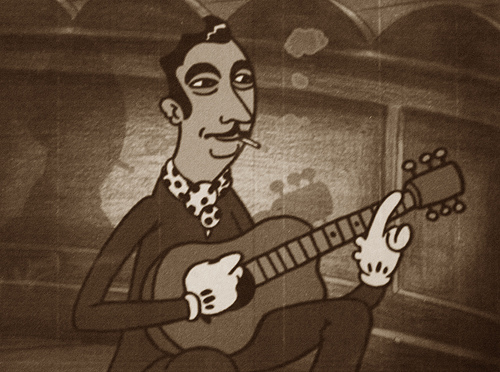 On this cool, misty morning I am reminded of one of my favorite versions, that being the one from Django Reinhardt, the jazz guitarist from the middle of the last century whose distinctive gypsy-tinged plucking, the result of basically playing with only two fingers on his left hand as a result of an injury received in a fire in his youth, has influenced artists long after he passed away.